George Washington's 284th birthday is being marked at the northern Virginia estate of the nation's first president. FBI Director James Comey will lead the celebration of Washington's birthday at the Founding Father's Mount Vernon estate. Comey will speak at Mount Vernon at 10:30 a.m. Monday, shortly after a wreath laying ceremony at Washington's tomb. The day's activities will also include patriotic music and a military firing demonstration. The 3rd U.S. Infantry Regiment, or The Old Guard, will play a key role in the birthday celebration. The Old Guard is the oldest active-duty infantry unit in the Army, dating back to 1784. 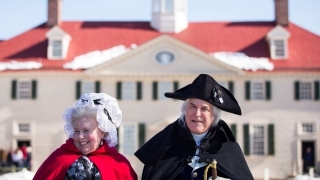 Mount Vernon offers free admission on Monday as well. More than 10,000 people are expected to visit. While the holiday has commonly become known as Presidents Day, the federal government still designates the third Monday in February as a holiday celebrating Washington's Birthday. The actual birthday is Feb. 22.